Melt butter in heavy large pot over medium-high heat. 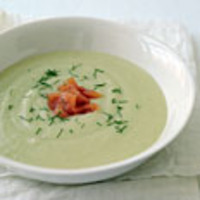 Add fennel, leek, and fennel seeds and cook until vegetables begin to soften, stirring often, about 8 minutes. Add potatoes and 5 1/2 cups broth. Bring to boil; reduce heat to medium. Cover with lid slightly ajar and simmer until potatoes are tender, about 12 minutes. Working in batches, puree soup in blender. Return soup to pot and rewarm over medium heat, stirring often and thinning with more broth by . cupfuls for desired consistency. Season soup with salt and pepper. Awesome! Made this tonight for a dinner party and it was the hit of the night. I added a little cayenne pepper to spice it up. HIGHLY recommend. By the way, the salmon garnish works perfectly against the soup. Don't leave it out! I loved this soup! The salmon was a nice contrast in color, as well as in flavor. I would make this any time of the year. Great soup. Unlike the picture, t'was made with cut chunks of the fennel frond that gave something to crunch on. It was pretty light/refreshing & probably could be served cold on a hot summer day.